Is there anything Steven Spielberg loves more than kids learning about love and loss against the backdrop of war? Frankly, it's amazing it took him this long to make "War Horse." Spielberg's new film is based on Michael Morpurgo's 1982 children's novel about a boy named Albert whose beloved horse, Joey, is sold to the British cavalry and sent off to fight the Germans in France. But "War Horse" didn't really hit the zeitgeist until it was adapted into a critically acclaimed stage production in London, featuring life-size horse puppets. The play later moved to Broadway where it won a small bucket of Tonys. The trailer for Spielberg's take, which stars David Thewlis, Benedict Cumberbatch, Jeremy Irvine, Emily Watson and Tom Hiddleston, looks stunning. But the whole thing positively brims with schmaltz, with John Williams score adding that extra bit of gag-inducement. 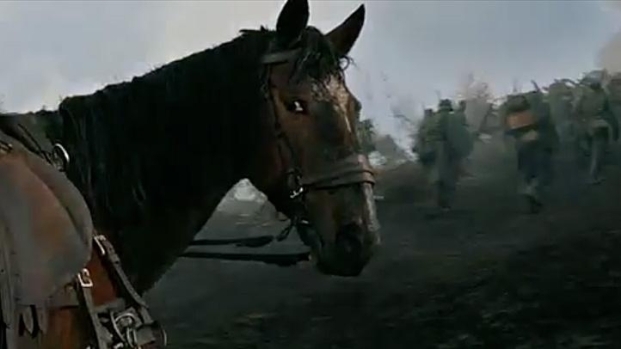 From director Steven Spielberg comes an adaptation of the story of a young boy and his horse, who are torn apart by World War I. Opens Dec. 28. "War Horse" opens Dec. 28.